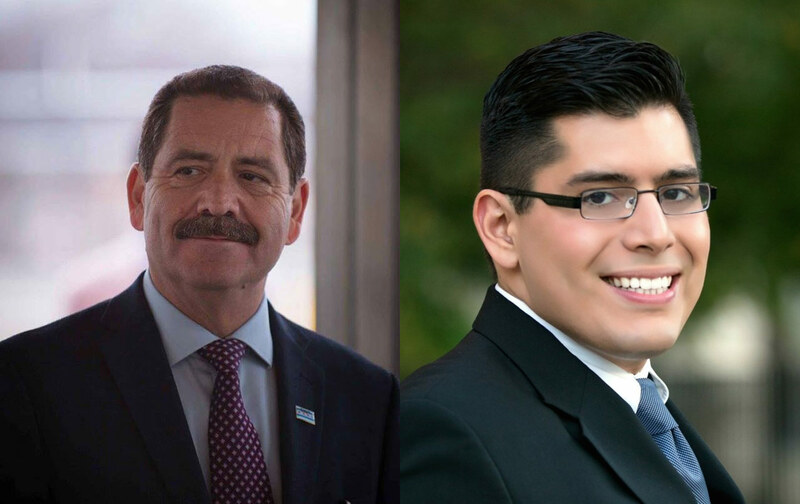 But is the race between Chuy Garcia and Carlos Ramirez-Rosa a sign of progressive strength—or weakness? There are some people who’ll tell you that the race shaping up to succeed Representative Luis Gutierrez in Illinois’s 4th congressional district is simply an indication of how dominant progressives have become in Chicago. The fact that Jesus “Chuy” Garcia, the challenger who forced Mayor Rahm Emanuel into a runoff in 2015, and Carlos Ramirez-Rosa, the young alderman who has been the most prominent thorn in Emanuel’s side since his own election to the City Council that year, have both filed petitions is, according to this view, an embarrassment of political riches that should be cause for celebration on the left. It would certainly be pretty to think so. Electing either man would be a huge improvement for the district—a headphones-shaped gerrymander connecting the Puerto Rican neighborhoods in the city’s north side with Mexican districts south of the Loop to produce a reliable Latino majority. Despite his long membership in the Congressional Progressive Caucus and his close association with Harold Washington’s reforms, Gutierrez has never shown much appetite for fighting City Hall, having been a loyal backer of Richard M. Daley and having, more recently, endorsed Emanuel. By this account also, the mayor’s relief at seeing Garcia, his most threatening opponent, taken off the board is purely coincidental. More cynical souls, however, will point to a rally last week—in which Gutierrez, who during the 2016 primary campaign gleefully functioned as Hilary Clinton’s local attack dog, at one point saying he wasn’t sure Bernie Sanders “likes immigrants,” anointed Garcia, a key Sanders surrogate—as evidence not of progressive strength but of weakness. This view, sadly, was only strengthened when Sanders himself endorsed Garcia—before the Chicago Our Revolution group even had a chance to poll its membership. It’s not that the endorsement itself was a surprise—or that there was anything untoward in Sanders’s supporting Chuy, who backed his presidential candidacy when the Vermonter was still polling in single digits, and who has had a long, distinguished career fighting for immigrants, workers’ rights, universal health care, and other progressive causes. But as the most powerful progressive in the country, who ran on the slogan “Not me, us,” it would have been nice to see Sanders even pretending to put movement building ahead of personal loyalty. Particularly for millennial activists who, inspired by Ramirez-Rosa, have flocked to join the Democratic Socialists of America, and who helped Sanders pile up 61 percent of the vote—one of his biggest majorities in the state—in the alderman’s 35th Ward. Instead the current picture is of the local left in disarray, with Reclaim Chicago, the People’s Lobby, and United Working Families all currently reduced to anxious silence in the hope that the contest between their two champions doesn’t get ugly. Which, sadly, is far from impossible. Such was the growing reputation of Ramirez-Rosa that in September the first-term alderman was tapped as a running mate by Daniel Biss, the state senator running as a progressive challenger to J.B. Pritzker, the billionaire venture capitalist who’s considered the leading contender for the Democratic nomination for governor. Ramirez-Rosa’s candidacy for lieutenant governor lasted less than a week, however, when Biss dropped him over the DSA member’s refusal to disavow the group’s support for the Boycott, Divestment and Sanctions (BDS) movement on Israel/Palestine. Last week, when Garcia was asked whether there were any substantive policy differences between him and Ramirez-Rosa, he replied that one area where “we may have a little nuance is on the question of Israel and BDS,” which he said he opposes. There were just six days left to file petitions when Gutierrez withdrew in favor of Garcia, who submitted over 15,000 names—far in excess of the 864 required by law and far ahead of the 5,000 submitted by Ramirez Rosa, or by Sol Flores, a community activist who is also the only woman in the race. If this early test is an indication of relative strength, Garcia should cruise to the nomination. Clem Balanoff, a longtime Garcia advisor (who is also Illinois chair of Our Revolution) says that as far as he’s concerned there is no rancor between the two progressives. “Our only fight is with the machine,” he said, noting that Flores had served on Emanuel’s transition team. Still, if voters blame this last minute game of musical chairs on Emanuel, Garcia may come to regret accepting Gutierrez’s endorsement. On the other hand, if Garcia and Ramirez-Rosa keep their aim on Chicago’s machine, whichever of the two doesn’t go to Washington would make a fine mayor.